← How to convert MS Office Word documents of doc to tga? PNM, or Portable Any Map, is an image format that was designed to handle several types of portable monochrome, gray scale, and color images. This format may include raster graphic data in the portable pixmap file format (PPM), the portable graymap file format (PGM) and the portable bitmap file format (PBM). WMF, or Windows Metafile Format, is used primarily for vector images, but can also include raster graphics. When you want to rotate the page as you convert WMF to PNM, you should use VeryPDF HTML Converter Command Line to help you. VeryPDF HTML Converter Command Line can not only be used to convert web pages, also it can be used to convert image files. VeryPDF HTML Converter Command Line can quickly and reliably convert WMF to PNM. Apart from that, it can be used to add watermarks, adjust the margin, change the size of the page, etc. This article aims to show you how to rotate the page and convert WMF to PNM via command line. It will take four steps to do so. Click VeryPDF HTML Converter Command Line to download this software application. Only a couple of seconds are needed to install it. After VeryPDF HTML Converter Command Line is installed, please proceed to the next step. If you want to buy VeryPDF HTML Converter Command Line, please click Purchase. To open the command prompt window only takes four steps: click “Start” in the left-down corner of the screen; > click “Run” on the home menu that appears on the desktop, then the “Run” dialog box will pop out.> Enter “cmd” in the “Run” dialog box;> click “OK”. Then the command prompt window will appear on the screen. The executable file ---- htmltools. It is the main executable file of VeryPDF HTML Converter Command Line. In conclusion, the form of the command line should be like the following. Second, when you type a command line, make sure that all the files are represented by the directories rather than only their file names. This is because computer can seldom recognize the bare file names in a command line if the directories are not provided. The following is an example which can be used to batch convert WMF to PNM and rotate the page. D:\htmltools\htmltools.exe ---- the directory of the executable file. In the example, it displays that the executable file htmltools.exe is located in the folder htmltools on disk D.
C:\in\*.wmf ---- the directory of the input files. The wildcard * represents all the input WMF files in the folder in on disk C.
D:\out\*.pnm---- the directory of output files. The file extension specifies PNM as the output format. It indicates that all the result files must be saved in the PNM format and should be placed in the folder out on disk D.
All the directories of the files in the example are allowed to be replaced, depending on the circumstances on your computer. Besides, the number which stands for the angle degree can also be changed, according to your priorities. As you press “Enter” on the keyboard, the computer begins to convert WMF to PNM in batch. 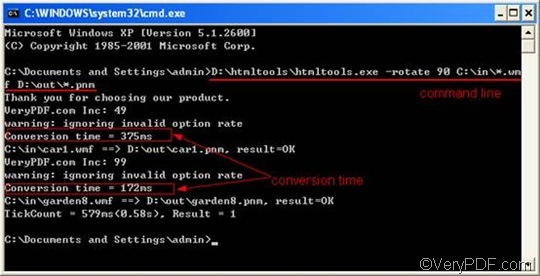 Meanwhile, the command prompt window will display the conversion time and process of conversion. The following prompt is the command prompt window with the example command line and the process information. If you want to get more information about how to convert WMF to other files, please read related articles at the knowledge base of VeryPDF. If you are interested in other products, please visit the home page of VeryPDF. This entry was posted in HTML Converter (htmltools) and tagged command line, rotate the page, wmf to pnm. Bookmark the permalink.